That’s the highest level in history. While most analysts view this as a threat to the auto industry, I see it as a symptom of a bigger problem that should set off alarm bells nationwide. 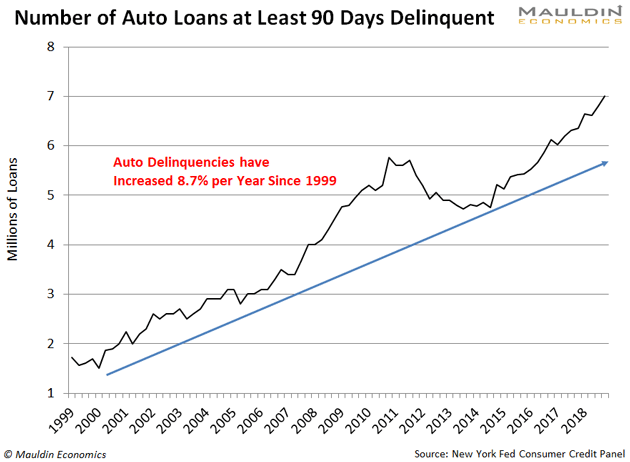 Notice what I said earlier: auto loans are a high priority payment. Everyone is well aware that their well-being depends on these payments. The number of Americans who don’t have enough money for even high priority payments is rising fast. That’s not a sign of a healthy economy. 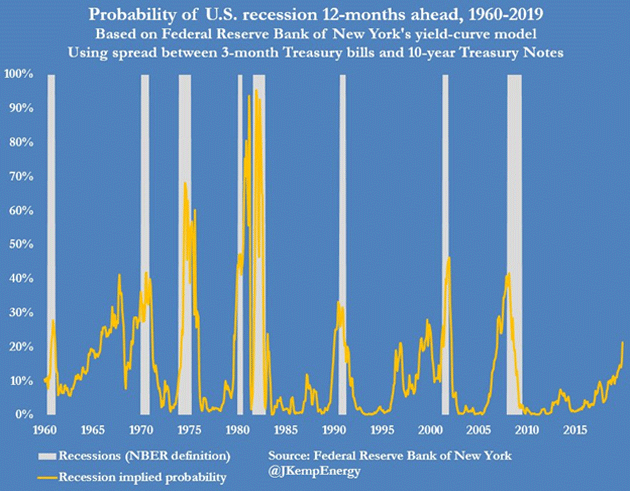 Instead, it’s a sign that we’re not too far from a recession. I’m not alone in this thinking. When the Fed is worried, you take notice. The last time they were so pessimistic about our economy we faced the 2008 financial crisis. Another key piece of data signaling the end of this economic cycle is consumer spending. Consumer spending is the main driver of economic growth. And it’s starting to falter. 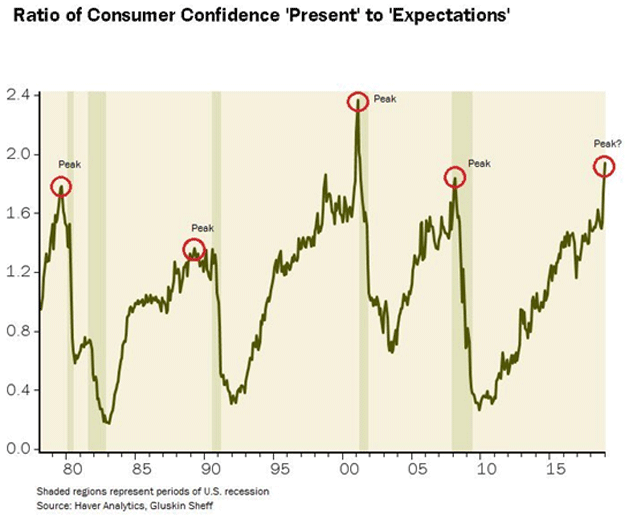 The chart below shows the difference between current and future expectations in consumer spending. The higher the reading, the lower spending is expected to be in the future. Another key gauge of consumer spending is retail sales. No positive news here either. Last month, retail sales fell at the fastest pace since 2009. The bad news is mounting up. It’s a clear sign the economy is at the tail end of the cycle. Now it’s only a matter of time before a recession hits. If you go to cash, you’re not making any money. You’re actually losing money to inflation. With bonds, you’re earning a paltry 2–3% return on your investment. That’s why I prefer dividend-paying stocks. See, my forte is income investing. This means buying stable, reliable companies that will deliver solid results no matter what’s happening in the economy. And I’ve done it for most of my life. Dividend-paying stocks have a long history of riding out financial storms. Even a simple strategy like buying the 10 stocks with the highest dividend yields from the Dow Jones Industrial Average (DJIA) beats the market over the long run. For instance, between 1996 and 2006, the DJIA returned 356%. But had you held the 10 DJIA stocks with the highest dividend yields instead, you would have earned 407%! This period included the dot-com crash. But this isn’t cherry-picked data. This same strategy worked in 2018. While the DJIA lost 6% of its value, the 10 stocks with the highest dividend yields lost a mere 1.5%. But the good long-term performance is not the only reason to own dividend stocks in a volatile market. Get access to the exclusive financial research John personally relies on. Special Offer expires February 27. Dividend-paying stocks have proven to outperform in both bull and bear markets. There’s good reason for this. First, dividend stock returns aren’t reliant only on the stock price. See, dividend stocks—while also benefitting from rising stock prices—offer bond-like payments. These payments add to your total return. Because dividends make up for some of the losses, dividend stock prices tend to fall less during bear markets. Another reason these stocks are more stable is that they are often very solid businesses. They are much more immune to economic weakness than other stocks. That’s why they have money to pay dividends in the first place. Remember back in October 2018 when the stock market was a roller coaster? 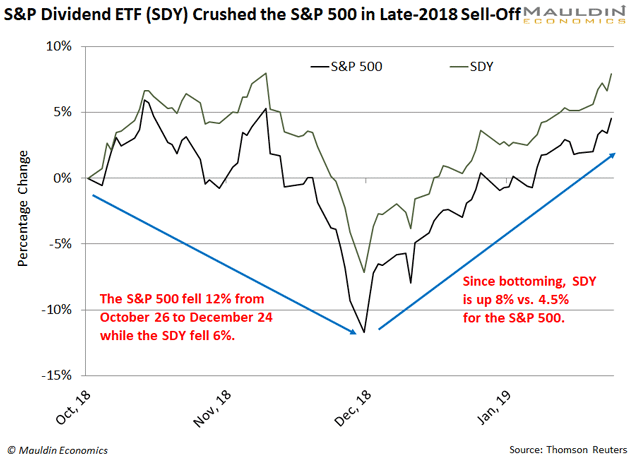 As you can see, the S&P Dividend ETF (SDY)—which holds a basket of dividend-paying stocks—fell much less than the S&P 500. It also bounced back even faster. Clearly, dividend stocks are what you want to hold in volatile times. But picking the right dividend-paying stocks is crucial. Subscribers to my premium investment service Yield Shark get the best dividend-paying stocks in their inbox every month. And while the DJIA lost 6% last year, my low-risk portfolio delivered a total return of 4.2%. If you want a taste of the types of stocks I recommend in Yield Shark, download my latest free special report. It includes three of my favorite dividend-paying stocks. Americans missing their car payments is one of the red flags popping up. And my readers know it won’t go away without a major reset in the markets. Bulletproof your portfolio with dividend stocks before it’s too late. If you want a good place to start, download my free special report here. Perhaps part of the debt problem is what we are “conned” into purchasing. Why would newly weds need a 2000 sq foot house, in an upscale subdivision and a shiny new Ford F150 pickup? Troll the internet and one finds monthly payments not prices. (a fancy one goes for toward $60K.) So, these days it is the size of the monthly payments not the price of the asset that is important? Getting started in life folks should be focused on “needs” not “Wants.” Take care of those needs. The airplane can come a bit later. Can you share your thoughts about why you haven’t recommended any preferred stocks?